GeoMedia is installed on the computer but the FME Integration Console does not have it listed. FME 64-bit installed but GeoMedia is a 32-bit application. A 64-bit FME cannot extend a 32-bit GeoMedia. The registry keys are not in place that FME looks for. 1) Make sure 32-bit FME is installed if 32-bit GeoMedia is installed. Paths\GeoMedia.exe for the path to the GeoMedia executable. 3) If the registry keys do NOT exist, re-install or repair GeoMedia and this should correclty populate the registry keys. 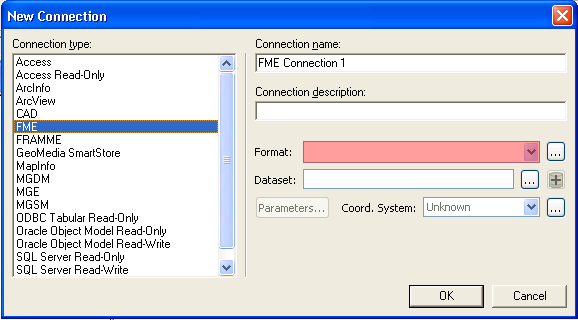 4) Check the FME Integration Console. The "FME Data Server for GeoMedia" should be listed. is this still valid for Version 2015 (both GeoMedia and FME)? I have both installed but the Connection Dialogue is not available.